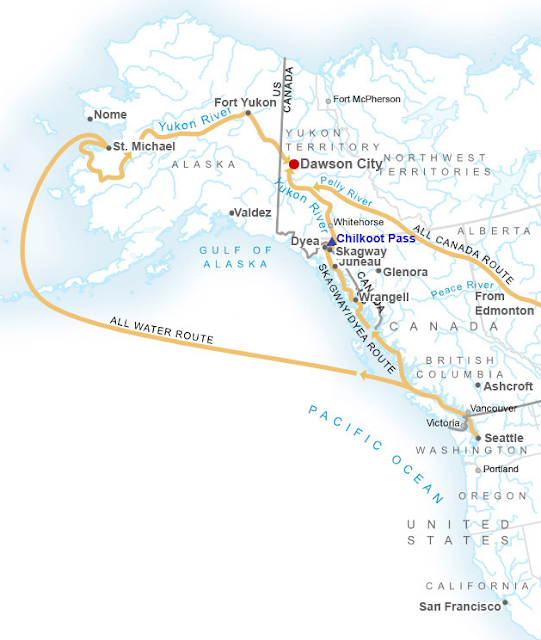 On June 25, 1897 the steamer the Alice carried a first load of gold through St. Michael's Trading post in Yupik territory on the western coast of the Alaska. Originally the Russian American company founded St. Michael Redoubt in 1833 and by 1897 the town of St. Michael became a major hub in the burgeoning Yukon-Alaska Gold Rush. The map below illustrates the Yukon trade routes the mineral would travel with St. Michael there on the shores of western Alaska Territory. Between 1886 and 1899 approximately 100,000 people entered (invaded?) the Alaska-Yukon area with aspirations of securing hefty tins of gold. This urgent haste started after, in August 1896, a group of Tagist family members, Shaaw Tláa, K̲áa Goox̱, and Keish, and Shaaw Tláa's non-Native husband George Carmack located gold in Rabbit Creek (afterwords known as Banaza Creek), around the relatively new (and contested) border between Alaska and Canada. The family decided to allow Carmack to announce the discovery to the trading post because the authorities would most likely have denied such claims made by Native people, leaving the claim open to others. When near-do-wells flooded the north armed with pick axes and gold pans they transformed the shape and governance structures of Natives villages and towns. For example within a year from three prospectors finding gold in the village of Siqnazuaq in 1897, which previously held less than a 1,000 residents, the population swelled to 10,000. Upon the coming of this immense amount of people, Siqnazuaq's name was changed to Nome, Alaska. It's estimated that by the early twentieth century the town's population reached 28, 000. Currently, the population sits under 4,000. 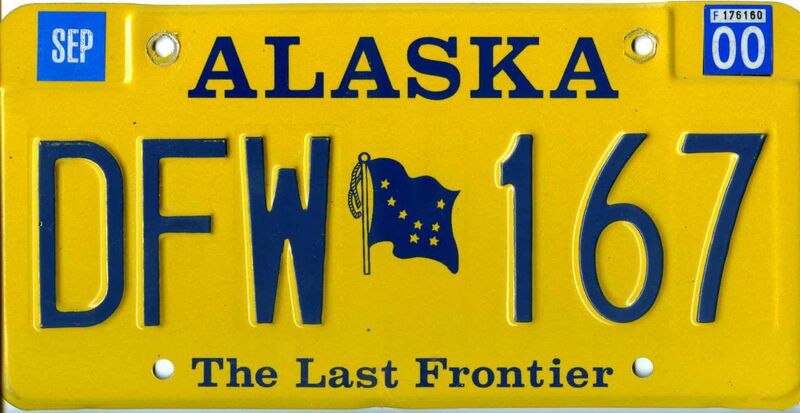 The Alaska Territory's boom economy reopened an American frontier once proclaimed closed by historian Fredrick Jackson Turner in 1893 with his work The Frontier in American History. In the nineteenth century there was an idea that the continent was an empty space allowing non-Natives to travel westward, securing land and sequestering and killing Native people, until the movement ended on the Pacific side of the contiguous part of the nation, what would be known as the "Lower-48." As the United States pushed westward that shifting border allowed those, within the context of U.S. sponsorship, to reinvent themselves. For Turner, the end of the frontier meant the foreclosure to a distinct way of life, an end for the ability of the nation's population to reinvent and adapt themselves to a new land. Fortunately for the nation, the gold rush in the Alaska Territory created a "Last Frontier" bringing with it a sense of renewal to the nation's imagination. Factory workers in the industrial economy could rest assured that there were rugged independent people at the edge of the nation living lives that their own social and financial situations disallowed them (this is of course the time when Inuit art came to serve a similar purpose). One such story of reinvention in the Last Frontier was that of prospector Felice Pedroni who uncovered gold amidst the shallows of Cleary Creek, now Pedro Creek, in the Fairbanks region of central Alaska allegedly on July 22, 1902. Born in Trignano di Fanano, Pedroni sailed to New York in 1881 at 23 years of age when he reinvented himself as Felix Pedro, donning a Hispanic name change. Working his way through the country he moved to the Yukon in 1895, with dreams of gold. His search went on for years as he worked claims on either side of the border. 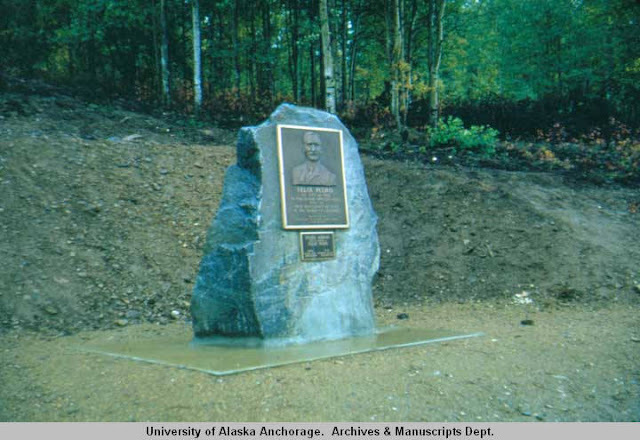 Upon a discovery near the Tanana Hills, he famously exclaimed, "There's gold in them there hills!" Journalist and historian Dermot Cole discusses the shadow of scandal and drama that surrounded Pedroni's life in this exciting article published through the Alaskan Newsminer.com. 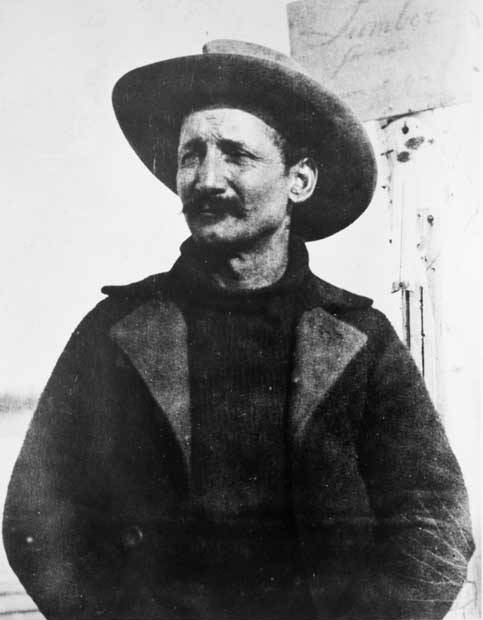 Pedroni's claim to the mining site proves complicated by a partner Alexander L. Hanot, whom Pedroni knew from his days working in Washington state. Pedro claimed that the only reason Hanot became a split partner with him was that latter owed him 75,000 dollars and that signing him into the claim protected Pedroni's assets due to an alleged maternity case. Hanot denied such allegations that he owed money or that even his share of the claim was fake in any sense. Pedro asserted that when he made the deal with Hanot he was not of a healthy mind. From 1903 to 1909 various people testified to Pedro's deteriorating mental health, notes Cole. Yet, other's testified to the contrary! In divorce papers, Cole writes, Pedro's wife accused her husband of fraud in the Hanot situation. 8 years after his claim, Pedro passed away at the age of 52. Reportedly losing his life to a heart attack, many thought he was a victim of murder. He body was buried in California and laid there until exhumed in 1972 to ship to his hometown in Italy. Upon the transfer, his body was examined and authorities determined his death was the result of ingesting poison. Many suspect his wife Mary Doran took his life. The notion of the frontier in the national imagery served for countless people such as Felice Pedroni shed their old lives as they domesticated an imagined frontier, refusing to acknowledge Indigenous lands, culture, and authority. One need not be Edward Said to see that the imaginative geography of imperial frontiers, which allow people to put forth, new names, or invented personas, are always home to other communities these actors help dispossess. Dermot Cole's article "Accusations of scandal, legal battle followed Felix Pedro to the grave"